Less than a week ago the Ethiopia coach Sewnet Bishaw could stroll the streets of Addis Ababa and nobody would have taken much notice. Now the 59-year-old waves and embraces Ethiopian fans who greet him following his team's 1-1 away in South Africa in their opening 2014 World Cup qualifier. "The people are very happy - they like it very much when we win," he said. "For us the result against South Africa was more than a draw - it was a victory," Bishaw told BBC Sport. Many see the result in South Africa as Ethiopia's greatest result at senior international level since winning the Africa Cup of Nations half a century ago. "We used to play away against the likes of Nigeria and Guinea and come back beaten but this time we've surprised everyone," he points out. It was a result that cost South Africa coach Pitso Mosimane his job as he agreed to step down from the job the day after the match. Although the draw with South Africa's Bafana Bafana did not spark street carnivals, it was enough for fans to sit up and take notice of a team they do not usually expect much from. It is a sad reflection on one of the founders of the Confederation of African Football and who have hosted the Nations Cup three times and last appeared in the finals back in 1982. Like many other African countries, the Spanish La Liga and the English Premier League are more popular than domestic football, including the national team. But this apathy could all change if Ethiopia can get all three points against the Central African Republic this Sunday. We can qualify but we just have to keep winning and working hard. Bishaw, who took over from the Belgian Tom Saintfiet last October, is confident that victory will give his side a major boost to their chances of reaching their first ever World Cup finals. "The game will be a turning point," he asserts. "We've obtained one point from a difficult away match and if we could get three points at home, the way [to Brazil] will become smoother and it will be left with us to make use of our chances. "We have a youthful side and we've only been together for just three weeks." But the coach admits getting all three points on Sunday will not be easy. 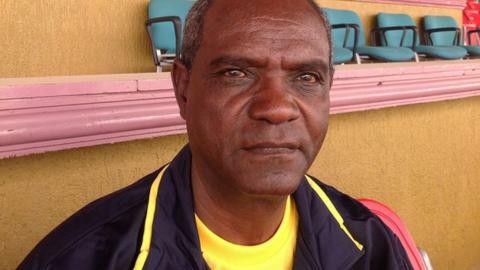 "We won't be leaving anything to chance against Central Africa," Bishaw added. "We will take them very seriously, especially the fact that they have a line-up of overseas-based players in Europe, Asia and Africa. "We can qualify but we just have to keep winning and working hard." Ethiopia are equal on points with South Africa in Group A of the qualifiers, while the Central African Republic top Group A after their 2-0 home win over Botswana last weekend. That win for the Central African Republic was their first in a World Cup qualifier since they joined Fifa 48 years ago.